he 18th century saw the composition of numerous pieces for wind instrument octets. In the Classical era, what was then known as "Harmoniemusik" was composed especially for them. The Thaous Ensemble ('thaous' is Egyptian for peacock) has dedicated itself to this tradition. The ensemble is a wind octet in the truly classic sense, with two pairs of oboes, clarinets, bassoons and horns, and some of the musicians have been playing together since their early youth. They were either members of Baden-Württenberg's Young Chamber Philharmonic Orchestra or they got to know each other when they were students. In the meantime, they are all soloists in prestigious orchestras, or professors and lecturers at various cultural institutions at home or abroad - the Frankfurt or the Würzburg Universities of Music and Performing Arts, for instance. Or the Hamburg State Opera, the Bavarian Radio Symphony Orchestra, the Zurich Opera House or the Deutsche Sinfonieorchester Berlin. Every single member of the Ensemble has won important prizes at national and international competitions. Some of them have held scholarships from the German President or from the German "Studienstiftung" and work regularly with top ensembles like the "Ensemble Modern". 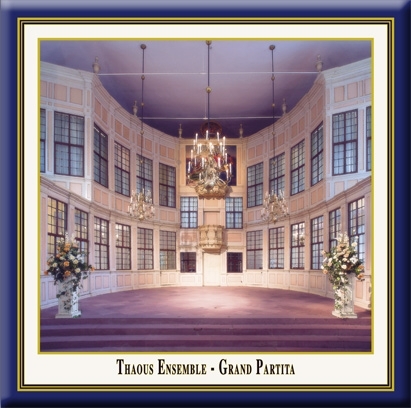 But more than anything else, the hallmark of the Thaous Ensemble is adaptability, because - depending on what is called for - the regular musicians in this classic wind octet will open their ranks to include soloists from elsewhere - from Hesse Public Radio Symphony Orchestra, the Gewandhaus Orchestra in Leipzig, the Frankfurt Opera and the Deutsche Oper Berlin. ozart composed the Gran Partita in 1780 for the Munich Court. He could count on some of the best virtuosi of his day to perform it, including his friend Anton Stadler - and Amadeus took full advantage of this. The serenade octet normally used until then was expanded what was more or less an orchestra, allowing Mozart to create a divertimento on the grand scale - not least because he was hoping that the Munich Court would provide him with a solution to his unloved responsibilities. However, the sonatinas of Mozart admirer Richard Strauss pick up on the ambience of the Gran Partita in the most remarkable way and are totally in the tradition of court entertainment in Mozart's time, even though they were written a century and a half later. t was thanks to Heinrich von Kleist's play "The Prince of Homburg" that the former residence of the Landgraves of Hesse-Homburg, a stone's throw away from the gates of Frankfurt, became world-famous. The palace with its wonderful gardens is probably one of the most beautiful baroque estates in Germany. It is therefore no wonder that the Prussian Kings and German Kaisers were very fond of spending the years between about 1866 and 1916 here. And also no doubt because of the relaxation and recreation provided by the town of Bad Homburg von der Höhe, a spa famous for its medicinal springs. Even the Prince of Wales used to come here in search of amusement, relaxation and "to take the waters" along with the English and Russian aristocracy. At the courts of Europe, art was extremely multi-faceted. The educated aristocracy was aware of the necessity to support and cultivate the fine arts, and in doing so, created the basis for Europe's ambience. And so it was thanks to arts patron Isaak von Sinclair that the poet genius Friedrich Hölderlin became the court librarian at Homburg Palace during the artistically formative years of his short life. It was here that Hölderlin wrote "Patmos", probably his best-known poem. In those days, much that was of little ostensible or commercial value in the fine arts or in literature and music aroused considerable attention and admiration, thus laying the foundations of our cultural life and identity today. Music that is new, pieces worth listening to and well worth conserving, little treasures from the traditional and the avant-garde - music that is unimaginable anywhere else but in the hotbed of Europe - our "Castle Concerts" series of recordings captures these in their original settings and preserves them for the future. By his endowment to the town church in Bad Homburg, Kaiser Wilhelm II unwittingly did the little church in the palace a favour and helped turn it into one of the most beautiful and intimate concert halls in Europe. The Palace Church fell into disuse and was forgotten, along with its magnificent late-18th century Bürgy organ. The turmoil and modernization fads of the 20th century passed it by, and it remained untouched until a local initiative, the "Bad Homburg Palace Church Trust", stepped in and secured enough patronage to save this architectural gem. True to the original and with a loving attention to detail, both church and organ were restored to create a truly wonderful concert hall. Today the Palace Church sparkles with a renewed radiance that is set off perfectly by the superb "Music in the Castle" concerts organized with such enthusiasm by Ulrike and Volker Northoff. >>> View Napster's Playlist "Best of Mozart"